During the week of March 25th, steelhead angler effort continued to shift upstream of Salmon, ID, and the majority of anglers were observed near the Pahsimeroi River confluence and upstream of the East Fork Salmon River in location code 19. The average catch rates from interviewed anglers improved upstream of Challis, ID and remained similar to the previous week in the areas downstream. Anglers downstream of the Lemhi River in location code 16 averaged 12 hours per steelhead caught. Anglers upstream of the Lemhi River in location code 17 averaged 45 hours per steelhead caught. Anglers upstream of the Pahsimeroi River in location code 18 averaged 24 hours per steelhead caught, and anglers upstream of the East Fork Salmon River in location code 19 averaged 5 hours per steelhead caught. River flows remained stable throughout the week. Currently, the Salmon River is flowing at 1,170 cfs through the town of Salmon, ID which is 94% of average for today’s date. The river’s visibility on Sunday was cloudy downstream of the Pahsimeroi River and clear upstream with water temperatures ranging from the upper 40s in location code 16 to the mid-40s in location code 19. Additionally, as of Friday March 29th the Pahsimeroi Hatchery had trapped 305 hatchery steelhead. 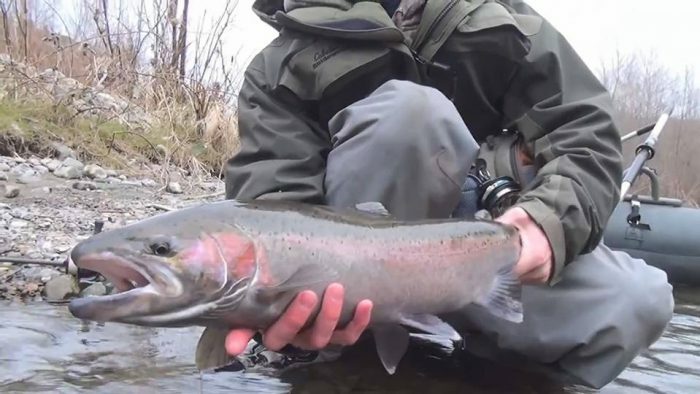 The Sawtooth Hatchery has also started trapping steelhead, but they will not get an exact count until their first sort and spawn day on Thursday, April 4th. As of Monday, April 1st, it is estimated that the Sawtooth Hatchery has trapped approximately 50 steelhead.